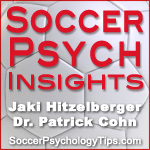 Welcome to episode 5 of Soccer Psych Insights. In this episode, Jaki Hitzelberger, MA, MGCP interviews Brazilian Soccer Coach, Eder Guimaraes on how to feel confident before soccer games. Eder talks about how to visualize success, focus on small achievable goals, and anticipate challenges. In addition to coaching soccer, Eder takes teams on tours to Brazil to experience the culture and play against Brazilian soccer teams. This is truly a unique and memorable experience for soccer players, coaches, and parents. What better year to travel to Brazil, than the year of the World Cup! Use the player below to learn how soccer players can perform with ultimate confidence in games!